Habitat welcomes people from all walks of life to join us as we partner with families seeking safe, stable and affordable homeownership. 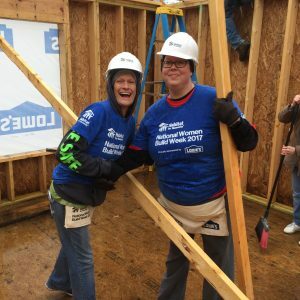 Habitat for Humanity is a Christian housing ministry uniting volunteers and local investors with hardworking families seeking to achieve the dream of homeownership. Established locally in 1990, Habitat served its first family in 1991 and has since partnered with families to build safe, stable and affordable homes and provide affordable mortgages. We believe all hardworking individuals and families should have access to safe, stable and affordable homeownership and seek to fulfill that vision by providing zero-interest mortgages on homes for those who qualify. The low cost of Habitat homes is made possible through the support of individuals, churches and businesses in the community, both financially and through volunteer efforts.